When did you start wearing your baby/young child? I started wearing my oldest when she was a few days old in a soft structured carrier. I have used stretchy and non stretchy wraps, padded and non padded ring slings, soft structured and “crotch danglers” carriers, onbuhimo, and a pouch sling. What is your favorite carrier? I actually have 2 favorite carriers, my non padded ring sling and my onbuhimo. What is your favorite carry? I love back carries! How did you first learn about Babywearing and what were your initial impressions of it? I first learned about wearing your baby when I was pregnant with my first child. I loved the concept of keeping my baby close. How many carriers do you own and what are they? Currently I have a woven wrap, a cotton ring sling, and a fleece pouch sling. Do you have a favorite babywearing story/scenario? Too many. I love all the moments I get to spend with my children. What is the strangest or funniest thing you’ve done while wearing your baby? Probably gone to the bathroom in a public restroom. The looks you get when you come out the stall!! What is your favorite thing about wearing your baby? The closeness. Knowing my child is comforted by our closeness. Catrina is the mother of 6 wonderful children. Cali 13, Isaac 11, Aiden 8, Rosy 5, Edison 2, and Lincoln is 3 weeks, and wife to her best friend and soul mate . She has worn/wears all her children, and even her twin nephews, in a variety of carriers. She loves the closeness and bonding that comes from babywearing. 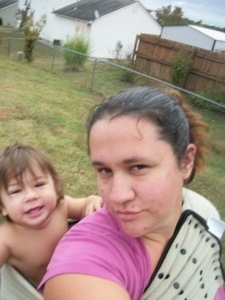 2 Responses to "Babywearing Mama Profile – Catrina"
I love that picture! Thanks for profiling me!